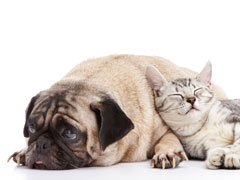 Disarming dogs or cats is a surgical procedure designed to reduce the potential for, or the severity of human injury from animal bites. Dr. Kressin co-authored a journal article on the "Myths and misconceptions in veterinary medicine". The disarming procedure can mislead companion animal owners to believe their pet will not bite and that humans and other animals will be "safe" from injury when interacting with disarmed animals. The fundamental problem with disarming dogs is that disarmed animals can continue to bite even without teeth and they can cause human or animal injury. It is always recommended to seek advice from a board certified animal behaviorist. The behavior (of biting) may be modified or corrected. Please do not allow anyone to "grind down" your companion's teeth in an attempt to disarm them. Dr. Kressin has had numerous telephone calls regarding painful pets after teeth have been ground down. This procedure causes pain or sensitivity from dentin or pulp (nerve) exposure! The American Veterinary Dental Colege has a position statement on crown amputation of canine teeth for sled dogs. "Grinding teeth down is an unacceptable procedure. These teeth must be treated by vital pulpotomy or by root canal therapy." Additional information on the changes in veterinary medicine, veterinary dentistry and the myths and misconceptions in veterinary dentistry can be found on this website.